Newport - Granny Flat - Pacific Modern Homes, Inc. 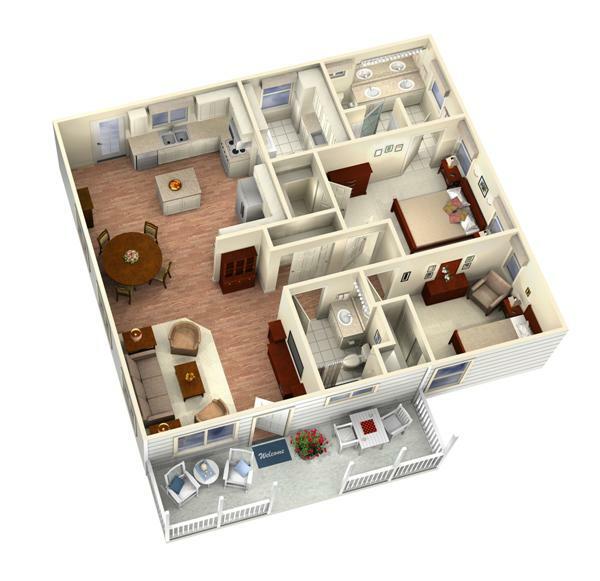 The Newport offers a spacious 1,196 square feet of living space. 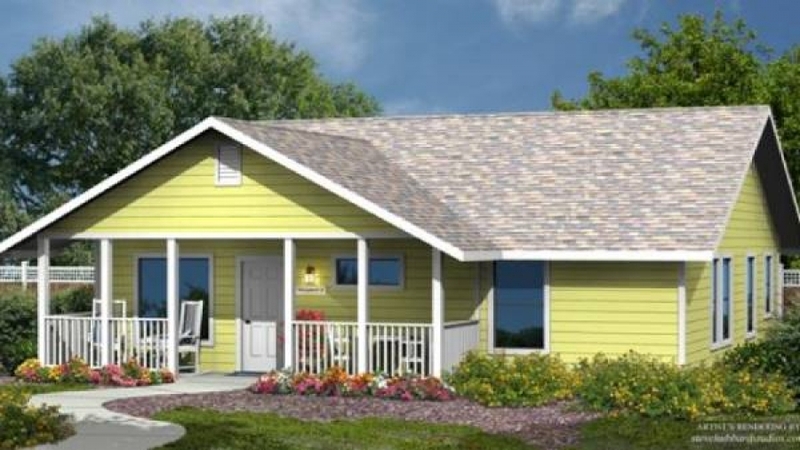 The front of the home boasts a generous porch for sitting and enjoying the outdoors, which can be easily screened-in. An open style living room and kitchen have vaulted ceilings. The kitchen is full-sized and adjoins a large laundry room with deep sink. The master bedroom is illuminated by two windows and includes a walk-in closet. Within the spacious bathroom is a walk-in shower. 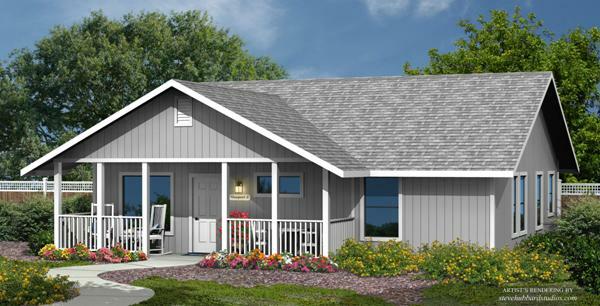 The Newport is designed to meet the needs for aging-in-place with a step-less entry, 36" wide doors and hallways. With three exterior styles (lap siding, stucco and panel siding) the Newport can be finished to complement your lot's existing residence. Refund Policy: All Sales are final and Returns and not accepted. Payment: Credit Card, Check or Wire Transfer. The Initial Minimum Package Payment can be paid by Credit Card. All further payment must be made by check or wire transfer. 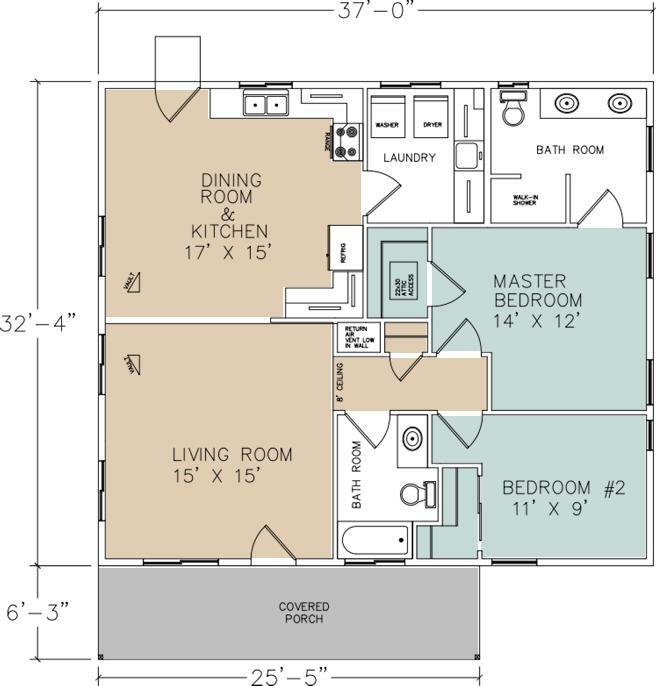 Pre-Engineered Construction Plans are included with the home package and will be delivered within 2-4 weeks of initial cleared minimum deposit. Subject to specific building site requirements and any potential requested changes to the Construction plan. Changes to the Construction Plan will be at an additional charge. a. Complete set of plansdrawn to the California Building Code (CBC), as interpreted byElk Grove, CA including the foundation design but exclude the Plot Plan, EnergyCalculations, Fire Sprinkler Design, Heating & Air Duct Designor anyothercity/county requirements. Please contact us at the phone number at the top of this page for details on getting the excluded items completed. b. Plans areengineered forlight-weight tile, PV solar panels, nosnow load, basic 110mphwind, Exposure"C" and SeismicZone D. Greater design loads available by quote only. c. 4 sets of plans, including 3 originalengineered stampedsetsand 1copy. If needed, additional plan sets can be purchased from PMHI. A local plan duplication service can duplicate the plan for the purpose of building this one (1) home. d. Roof Truss plan and Truss calculations. e. For Plan changes due to California Fire Hazard Severity Zone please add $ 180.
f. PMHI will be responsible for Building Department plan check questions relating to its work only. Generally speaking PMHI will respond to the plan check questions at no additional change. However, if the plan check requires significant plan / engineering changes due to issues beyond its control there maybe additional charges. g. Plandrafting & engineering costsmay increase as a result of local building ordinancesor planmodifications. If you have further plan modifications you would like to make, please call us at the phone number listed at this top page. Home Package Delivery: After completing the local required building permit process, a package can be delivered within 6 - 12 weeks of receiving cleared payment, subject to building material availabilities and weather conditions.